ome time last month a viral video was unleashed on the Internet that swept across the Dad-blogoverse like a wildfire. Ron Fugelseth documented one fantastic chapter in the Calvin-and-Hobbs-ish life of his son, a toy train named Stanley, and the amazing adventure that Stanley went on. Told through the perspective of a 4-year-old boy the video quickly exploded across the world, and suddenly Ron and his family were getting attention everywhere from the local papers, to bigtime network TV shows. The pinnacle of the experience was a trip for the whole family to New York to appear on the Katie Couric show, where Ron and Jayden happily shared a couch with Katie herself. 3.5 million views later and the video is still touching hearts the world over. Within an hour Ron and I were facebook-friends (I guess “facebook-friends” is a thing now, isn’t it?). Suddenly doing this project with my own kids was within grasp. And if I did manage to pull it off it would make for a fantastic blog post. Then it occurred to me, why would I blog about doing it with my own kids when I’ve got the main man right here in my own neighborhood? I could totally ask him about it, interview him even, and put THAT on my blog. He agreed, and last week we finally met up at a local watering hole to talk about the experience. Ron himself is a charming, genuine, extremely pleasant person to interview. He got up in the middle of our conversation to politely ask some rowdy drunks at the next table to keep it down because we were recording audio. The drunks asked what the audio was for and I nearly did a spit-take when Ron described me as a “big-time blogger”. 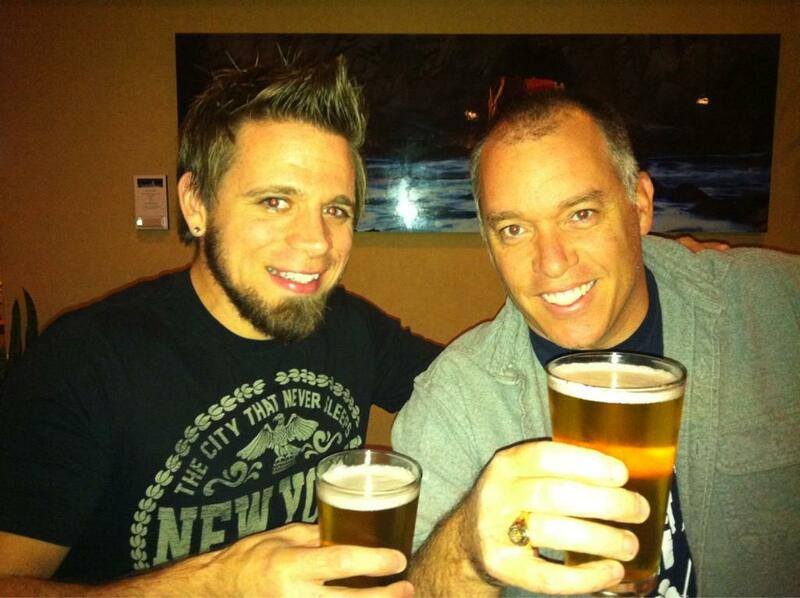 I don’t mind saying I thoroughly enjoyed sharing a beer and conversation with him over the course of two hours, not as a blogger doing an interview, but as a dude/dad/dork just hanging out with another dude/dad/dork. Ron is a man who, in my opinion, has his priorities right. He and I have more than a little in common and that made the conversation flow very naturally. It’s easy to be friends with a guy like Ron Fugelseth. By the time I got to interview him he’d already made the rounds to all the heavy hitters – The Associated Press, Katie Couric, and even another dad-blog. I came at the interview from the perspective that everything that could be asked had already been asked. Now that the 15 minutes are winding down we decided instead to focus our conversation on the experience as a whole – on what it’s like to have a viral video, and the effect that the experience has had on him and his family. DorkDaddy: Just so you know, last month I published what I thought was going to assure me a spot in the 2012 Dad-Of-The-Year finals. Not even one full week later your little video came out and blew my paltry little efforts out of the water. Every day since I look in the mirror and say to myself “Dude, you clearly need to up your game.” Do you have something to say to all the fathers out there you’ve put to shame? Ron Fugelseth: Well, I think we’ve all lived under the shadow of Bill Cosby for far too long now. For me I felt like someone had to do something really big, just without the sweaters, to solidify someone else in the position of the pudding-pop guy. I feel like I’m 6 to 36 months away from being the next pudding-pop guy. DD: Someday, when historians chronicle the history of Internet viral sensations, your chapter will come right after “Gungnam Style.” How does that sit with you? RF: When I think of what makes a viral video, what the tricks are: someone getting kicked in the nuts, some kid getting their finger bit, a silly dance, a cat rolling over… That’s what “viral” is to me. So the fact that mine went viral and has none of that is totally weird. DD: In our communications you have freely admitted that you are a dorkdad yourself. If you had to submit your dork-curriculum vitae, what sort of line-items might we see on it? 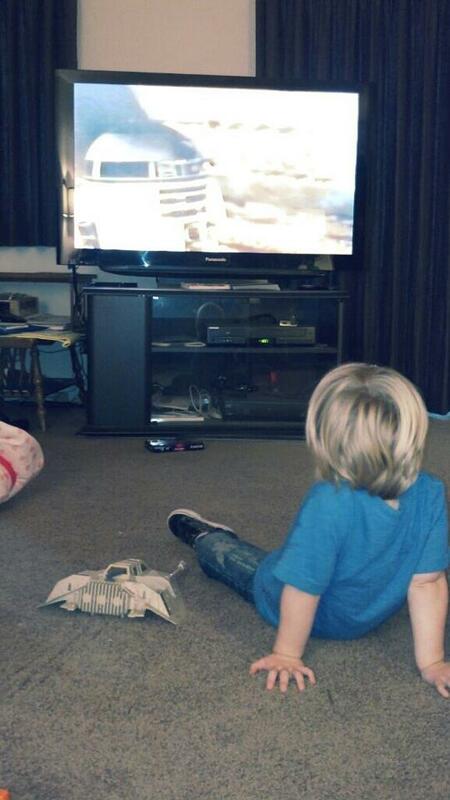 Ron’s son watching Star Wars after his dad gave him his old Snowspeeder toy. 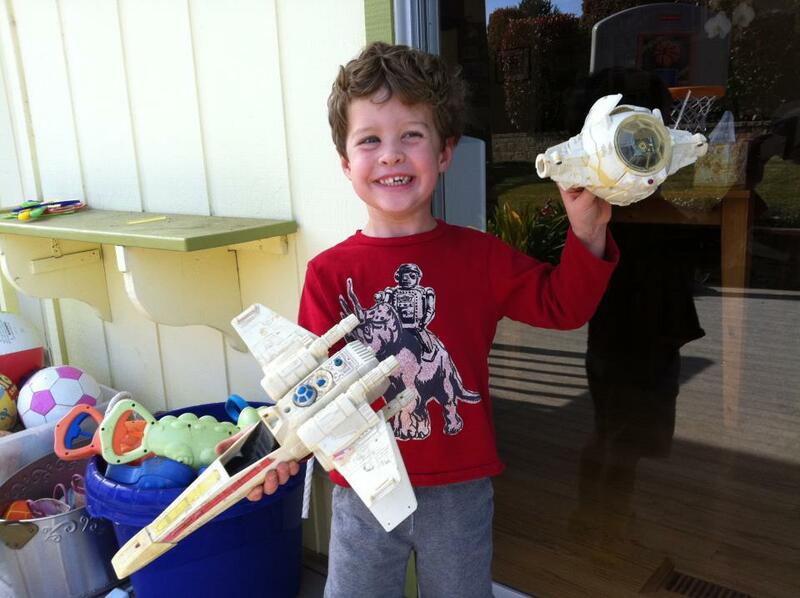 What sort of dork saves his old Star Wars toys for 30 years to give to his kids? RF: This is easy. When I was a kid, probably up to when I was a teenager, I had collected almost all of the original Star Wars figures. They’re still at my parent’s house with my Lego pirate ship that I assembled and never de-assembled. It’s all there. Also, when I turned thirty I built myself a m.a.m.e.-cabinet (multiple arcade machine emulator). It takes quarters, it’s got hundreds of games in it, I mean the *REAL* ROM’s. Total dork. I play “Street Fighter” with all my friends. Lastly, and this is the hugest one, I made a “Goonies” retrospective documentary. I worked on it with my business partner and my brother-in-law. We met Chunk, Corey Feldman, we went to Astoria for the 25th anniversary… Steven Speilberg and Richard Donner saw it. Richard Donner’s assistant called us and said he saw the documentary and he loved it. So two years ago in Astoria we got to go down the red carpet with the actors. Our website for it blew up. Crazy. I was sure that that was going to be my 15 minutes of fame… and it wasn’t. Who knew? DD: I think that qualifies you. I now certify you as a member of The Legion of Dorks. DD: Tell me a little bit about your family. *at this point the conversation drifted into keeping kids safe in the Internet age, which goes beyond the scope of this interview. DD: I won’t be so cheesy as to ask what your “parenting style” is, but when you think about it in your quiet moments, how do you approach your role as a father? RF: Although I think of my wife as the really structured one, you know she’s a school teacher, she’s very good at what she does, really good under pressure, really good at handling kids – I’m not as good at that. I’m the guy who’s like, “Well, maybe we’ll have a little bit of chocolate. Maybe we won’t go to bed exactly on time ‘cause we’re going to look at YouTube videos of stickbugs or a praying mantis.” I’m more loose in that way. I think the way I look at my parenting style is I’m very, I guess, touchy-feely. I’m always hugging and kissing and holding my children and constantly verbally telling them how much I love them. I’m constantly telling them “You make me happy.” I hope that that doesn’t end. I want them to grow up knowing that I love them. That’s my thing. DD: Something planted the seed in your mind for this particular project. Where did the idea come from and where did you get the instructions how to make it happen? And for the sake of my own personal self-esteem, please don’t tell me that you came up with it all on your own. RF: *laughing* Hell no. There’s no way. I am not the “smart science guy” that I knew growing up. This came just because I realized that I needed to document my son and his train, because it really is like Calvin and Hobbes. I knew I also wanted to work on my storytelling, to build a story out of this. And then I saw the “legoman in space” video that two high school kids did and I thought if they can do it, I’m a grownup, I should be able to do this. I got Stanley. I want to build a story. I got the video these kids made. There it was. DD: So then you obviously had to do some research. DD: To the casual viewer there’s a production value to this movie that goes way beyond Windows Movie Maker (which is where the limits of my home-movie skills lie). Tell me about your background in this regard. In other words, tell me why a normal dad has no hope of making a video of this quality. RF: I’ve been doing motion graphics, flash presentations, website design… all digital media is sort of what my company does. As a kid I drew pictures. Now as an adult it’s sort of become Photoshop, and Aftereffects and those sorts of things. It’s become my new creative outlet. With my business, everything I do something creative with it, it goes straight into the business. This was the first personal project where I had zero professional obligations, and it was really freeing. DD: And how about your educational background? Ron and his kid wearing matching Vans. 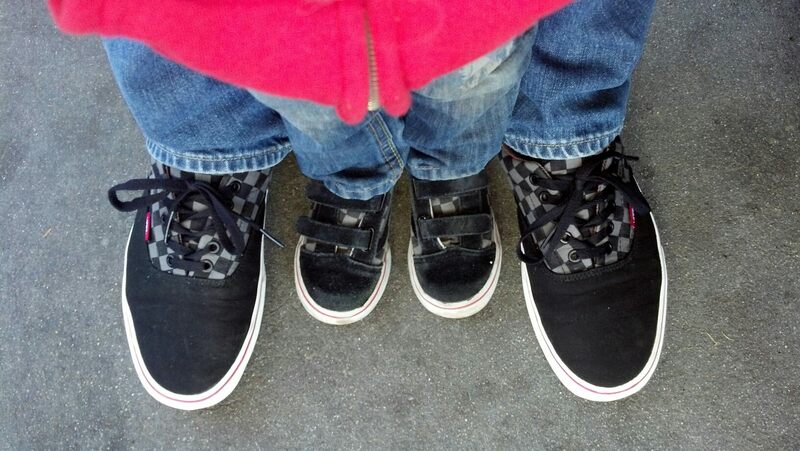 What sort of dork takes pictures of himself and his kid wearing matching Vans? RF: I have an AA in graphic design. I got hired right out of school. I went to this school called Masters Institute, it’s gone down now since the dot-com bubble crash, they were like “you spend an hour on general ed, and four hours on photoshop.” I was like “Oh, that’s for me!” So I just excelled. It was like I’d found myself. Suddenly I could have fun at school. I got hired right out of school, and I started working. Then the dot-com bubble happened and my business partner and I were working for a company doing what we’re doing now and we were like “Why don’t we just do this for ourselves?” And then we did and here we are. DD: So after I saw this and decided that I needed to do this with my kids, I started to get my head around the challenge. You found Stanley 27 miles away. As I wrapped my head around the project I realized 27 miles that way is the ocean, and 27 miles the other way are impossible mountains. I imagine there were logistical challenges to making this work that the casual viewer was completely unaware of. Dorkdad and his kid wearing matching Vans. 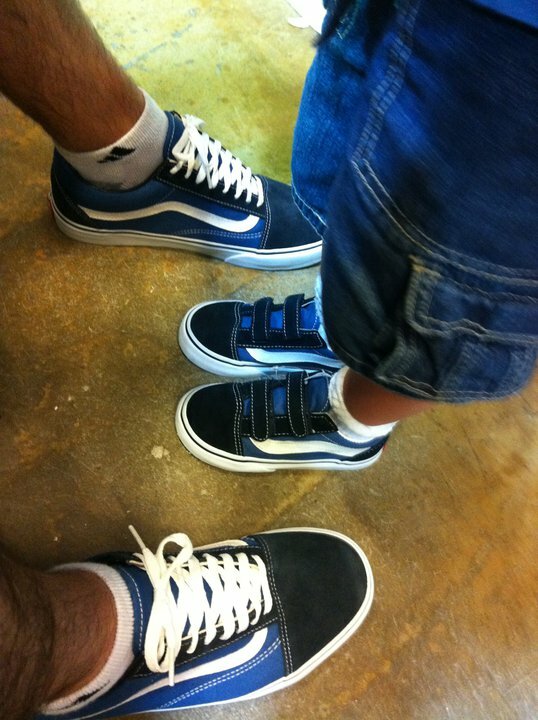 What sort of dork takes pictures of himself and his kid wearing matching Vans? 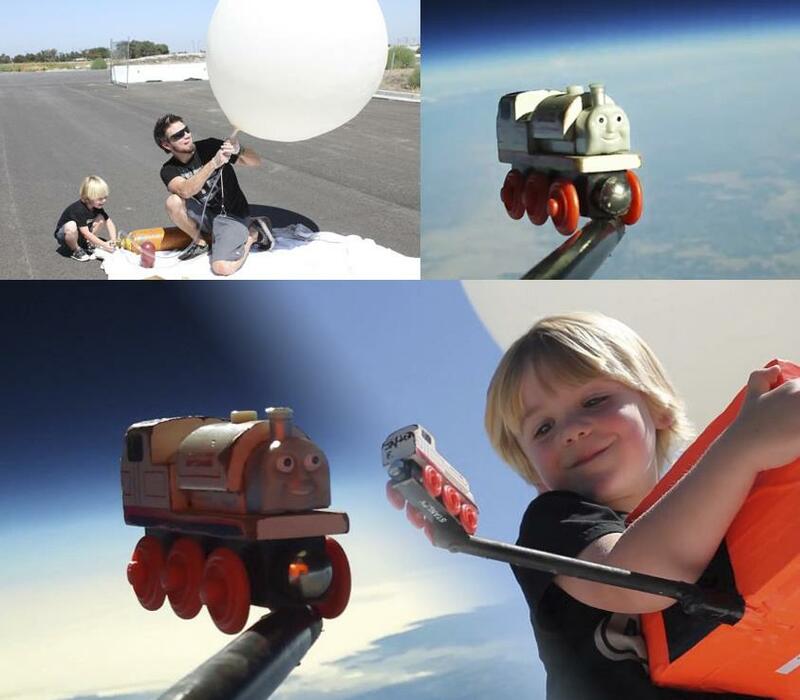 RF: It’s so funny that you ask that because for 6 months before I released the video I told my friends “Hey, I’m going to launch Stanley in space” and they were like “What?” Nobody got it. It was beyond what you think of as a normal household project. So like you figured out, there’s no way to launch a project like this where we live because the ocean is that way, the mountains are that way, and cell-phone coverage is lost. But my in-laws live in the East Bay, and we go there a lot, and I saw this one other group of guys do a launch from that area and I realized I could launch it from there too. So I found a website that actually predicts, from where you launch, where it will land based on today’s wind patterns, and it really worked. In fact, it worked so well that the day I went there it told me the wind had changed, and that it was going to head off in a direction where I was going to lose it. So I had to tell my wife “I know you’re going to be late for your hair appointment, but let’s stop in this other town and let it off there. It’s most likely going to land in this farming area. Let’s just do it.” And it worked. Logistically speaking it took me two months of watching the wind three times a week to finally find the day where I could tell where it was going to go so I wouldn’t lose it. DD: Which speaks to a level of obsession that no man needs to admit to for any project. RF: That may be true, but as a creatively oriented person I need something to focus on, like when I’m driving to meetings or whatever, and this gave me six months of focus. The entire process was fulfilling even before we launched it, before it went viral. DD: So there were obviously a hundred things that had to go right for this project to work at all – a lot of unknowns. The wind had to be right. The weather had to be right. You had to find Stanley. The camera had to work. Stanley had to be in focus. Can you describe for me your reaction at that moment when you loaded that memory card into the computer, saw the footage for the first time and realized that the whole thing actually worked and it was fracking awesome. RF: Well, finding Stanley in the cornfield at night was terrifying. When it landed my brother and I drove 45 minutes away to this field when it was getting dark. I go with my cell phone, the battery was dying, into the corn. I can only see 3 feet around me. There’s no seeing through the corn. It was dark. The corn was over my head. It was like deep sea diving. I was thinking to myself “Dude, this is bad.” So we leave and go back to my in-laws. Two days later I take my wife and kids out there again, Jayden’s asleep in the back of the car and I’m thinking to myself “Why am I putting my family through this?” So we get there and I’m weaving through the corn and all of a sudden I see orange, and my heart leapt. I thought “They’re back. This is it.” And I was just *hoping* the footage worked. But all I know is I have Stanley back. So that’s a win. So I get it. I don’t even touch it. I go get Jayden, wake him up from his nap, and I’m like “Oh, Jayden. Why don’t you look over here?” He finds it. Really that’s his reaction. He sees it. We drag it back. I open it up. Everything looked normal and intact. So I popped it into the computer, I look and my wife and I are watching this video. We were like “OK, there’s Stanley. He’s in focus. That’s great.” Suddenly I see black behind him and I said to myself “Oh my gosh. It worked.” That feeling of *Ron goes speechless for a moment* Like, I did this. I can’t even describe the feeling. I got Stanley back. He hit the corn. He didn’t break. His face stayed in focus. Everything went perfect. When have you ever put together a project like this when something didn’t go wrong – when everything went perfect. Never. This time it went perfect. DD: When this went viral I imagine your Email inbox being full, and the phone ringing off the hook in the living room, and Jayden out in the backyard playing with Stanley completely oblivious. How has this entire experience affected your family? RF: The thing I realized is that Jayden and my daughter have no idea. All they know is we talked about it for six months, and we got to see a video about it. He just knows we spent time together. We made Stanley go on the TV. Stanley went to space. Now he knows that there’s Angry Birds in space, there’s Stanley in space, we’ve got library books of space, so he’s starting to get it. It’s so fun having 15 minutes of fame, but having the subject of it being so oblivious to it… I still have to be the dad to this kid who doesn’t think I’m any better or any worse. He doesn’t care. It’s am I going to read him a book or not. That’s been awesome. DD: What are the perks and pitfalls of having a viral video that people may or may not be aware of? RF: I did not intend for my kids to be “out there.” That’s uncomfortable. It’s also weird when we’re out somewhere and I get mad at him in public and suddenly I’m thinking do I have to put on a front because we’re public? Going to places and people who own the restaurant we’re in recognize me from the video and come to talk to me about it. And now here’s my son who’s not eating and who’s being difficult because he’s tired, and I need to be a parent. Yet we *need to be so fun and look so cool and look like we’re perfect people*. It’s silly to say. I’m not a celebrity. But I now get a tiny, tiny, tiny taste of what they must go through. The other side of it is that people who have viral videos, it can almost become their worst enemy because now you have an audience with expectations – so I have more to think about. It’s harder for me to get that perspective back. Am I making “3 Men and a Baby 2” or “Weekend At Berney’s 2”? So it’s a parentally and creatively weird place to be in. DD: So now that the 15 minutes are winding down, how do you reflect back on the experience? RF: You know, the writer and director of “Toy Story 3” tweeted my movie. Things like that will never go away. How do you process things like that? I get to be this guest artist at the WACOM website. It’s a really great company that makes this really great tablet – it’s how I live professionally. They called and asked if I used their product. I was like “Of course I use your product.” So they sent me some stuff. Adobe tweeted my video. So how do you come out the other side of that sort of thing? I don’t want to be like “Oh, I’m special.” I’m just a guy who came up with a funny thing. So I’m trying to keep it realistic. I’m still the same semi-self-deprecating person I was before. Whatever I come up with has to go with my family, my son and my friends. I can’t worry about what other people think. I can’t be the crazy viral-video maker. DD: OK, I’d like take a different direction here. Let’s try a little free-association. I’m going to give you some choices and you give me the first instinctive answer that comes to mind. Don’t think too much. You have to go with your gut here. DD: Oh it’s going to be like that, is it? RF: I told you, I’m a creative person. DD: That’s cool. You get one free pass. How about Mac or PC? RF: PC. I used to be Mac and I’ll never go back. RF: I guess I’m not a comic book person. But I like the X-men movies, so whatever they are that’s for me. DD: Batman and Superman are DC though. You just have to know that. RF: Ooooh. That’s tough then. But I picked Marvel, so I have to go with it. DD: Sean Connery or Daniel Craig? RF: I’m only going with Daniel Craig because my wife likes him. DD: Hunger Games or Dragon Tattoo? RF: I’m gonna go with Dragon Tattoo even though there were so many uncomfortable situations. But I went to go see the other one to appease my wife and I was like… no way. DD: This one I suspect you’re going to have strong feelings about. Thundercats or Voltron? RF: Woah. This is tough. This goes straight to the heart of my childhood. DD: This establishes what kind of person you are, so take your time. RF: I wish you’d said Transformers or Gobots. That would have been easy. I’m gonna go with Thundercats. DD: Star Wars or Star Trek? RF: Oh, Star Wars. Star Wars was my childhood. Star Trek I don’t even get. DD: So let’s get you some redemption. Ewoks or Gungans? RF: Ewoks, dude. Oh yeah. RF: Indiana Jones, hands down. RF: Dude, you know my Mr. T obsession. DD: That’s why I asked. RF: B.A. man. I mean Clubber Lang is to me B.A. Baraccus playing Clubber Lang. It’s A-Team all the way. DD: OK. Well done. I think we got an accurate peak into your soul. What’s next for Stanley? RF: The truth is there’s nothing next for Stanley beyond whatever my son says. I was literally cleaning up toys before I got here and Jayden was on the couch and he said “Daddy, don’t clean up Stanley.” Stanley is going to live on with my son in the way that everyone knows. I mean Stanley is really real. As far as my perspective, my next video is going to be more like what I think of as an afternoon with Jayden and Stanley. It’s more like a dad having fun with his kids. And then I’ve got kind of an elaborate idea for the next one that I’m slowly storyboarding because it’s got some challenges, and it’s got a storyline that for me would pull out emotion. 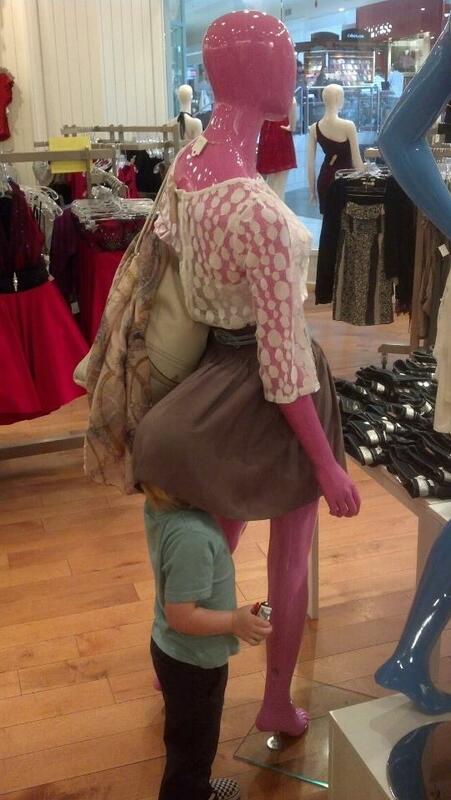 A picture of Ron’s son as the family frantically shopped for clothes to wear to New York. Ron assures me that this picture has nothing to do with the next place Stanley’s going. RF: *interrupts the question* Yes. DD: …as hot as they say she is? DD: And now keeping in mind the fact that I’m about to pick up the tab for our beers, who’s a better interviewer, me or the guys from How To Be A Dad? RF: Well, you bought me beer. They didn’t buy me beer. So I’m going to go with the beer-factor and say you are because I’m kind of buzzed. I guess that means I’m a cheap date. DD: And with that we conclude our interview. Thank you very much. RF: Thank you, man. That was a blast. To follow the further adventures of Stanley and Jayden, check out their Facebook page here. How does one SEND BEER ACROSS FACEBOOK? Haha!! The little-blog-that-could wins at last! !